HOW DOES MUSIC SOUND THROUGH A COCHLEAR IMPLANT? This is through the ears of a cochlear implant user but was close to the same when I was profoundly deaf and wearing hearing aids. BUT, it’s Oldies! Ok, here’s my chance to recognize something and possibly enjoy. Wow, I know that introduction. I hear the rhythm just FINE. Cool, I know that bass line! It’s a well-known bass line like from HEARD IT IN THE GRAPEVINE or Paul McCartney starting up; da da da da da da da da ”I heard it’s your birthday” da da da da da da da da ”It’s my birthday to you”. What luck! So, I’ve heard the da da da da da da da da on the bass. Ok, I hear it great. But, oh, now the Beatles are starting to sing. IN MY MIND I KNEW EXACTLY THE KEY THEY SHOULD START SINGING IN BECAUSE i HEARD THE BASS GREAT! But, as they start singing, they’re in the WRONG key. They’re really FLAT! (sorry Paul) As hard as I try to mentally raise the pitch; sometimes I can, it wants desperately to drop down again. So now you know. Would YOU like to listen to under-water music? Probably, under-water music would have bad rhythm too, but I can hear the rhythm nicely. Why can’t I hear the NEW songs? How can I sort of hear the OLD ones? As soon as I hear that bass line, or SOME other clue, my MEMORIES take over, so that along with the clues I GUESS I’M IMAGINING THE SONG! 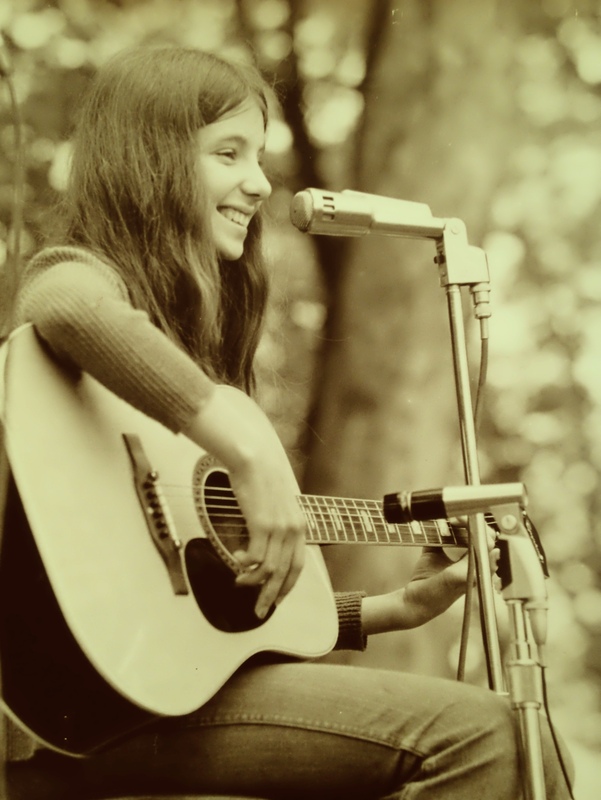 Me, age 15, playing at some hippy concert in Simsbury, CT. Photo by Walter Wick! Cool! Check me out at http://www.NanetteFlorian.com I just put up another song I wrote. A Country song called “You’d help me by loving me” produced by Paul Lombardo, Tom Russo, Bill Holloman and sung by Wendy Drown.